Brazil wishes to become the first team to qualify for the last 16 certainly fail. Mexico is a solid game in the second match of Group A at Estadio Governador Aderaldo Placido Castelo on Wednesday, June 18, 2014 who hold ambitions to host the final score 0-0. Throughout the match Brazil is not really able to find space in the Mexican defense appears solid. With El Tri wait very patiently Brazilian attacking game with offside trap. Miguel Herrera out occasionally attacking forces. As in the 24 minutes in which Hector Herrera kicks after the two players managed to outwit the host. A minute later a ripe opportunity Neymar's header was saved by the very well by Ochoa. Ochoa re-create the Brazilian supporters shaking his head after the rescue again he did to dissuade Fred's header from a corner kick Neymar. Dominance Brazil often makes the game run half the pitch alone, attacks carried out from either side of the center wing also did not produce results. Only in the 44th minute, David Luiz is unmarked in the penalty box to get a chance to change the score, once again the keeper Ochoa action makes the game still scoreless. 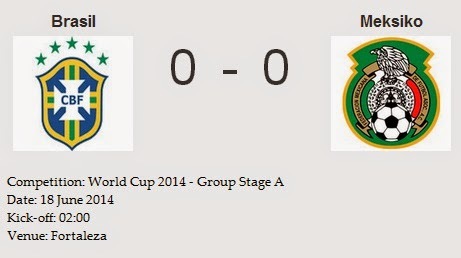 The first half ended with the score 0-0. Not to change the scheme of the game, Mexico remains resilient in defense, was provoked by the actions of individual players of Brazil. Brazil are frustrated with the tight back line led by Mexican Rafael Marquez, a number of substitutions was coloring the second half of the game. Thiago Silva had to cut her ball dropped makes Javier Hernandez, also received a yellow card by the Brazilian captain in the 80th minute, a free kick unfortunately Giovani do Santos did not return any results. Ochoa prowess in keeping his goal was admirable, towards the end of the game he was holding back a chance with a powerful header Samba Team Thiago Silva. Even Selecao nearly missed kick in injury time when a thin Guardado floated over the bar Julio Cesar. Whistle blowing referee Cuneyt Cakir long to notch a 0-0 final two teams both have four points from two matches, which means ticket to qualify for the last 16 from Group A is still to be determined in the third game. Line up Brazil: Julio Cesar, Dani Alves, David Luiz, Thiago Silva, Marcelo, Paulinho, Fred (Jo 68 '), Neymar, Oscar (Willian 84'), Ramires (Bernard 46 '), Luiz Gustavo. You're reading an article entitled Foiled Ambition Brazil Mexico written by Other World Cup which contains about : And I'm sorry, you are not allowed to copy and paste this article.